I have been having a tidy up !!!! 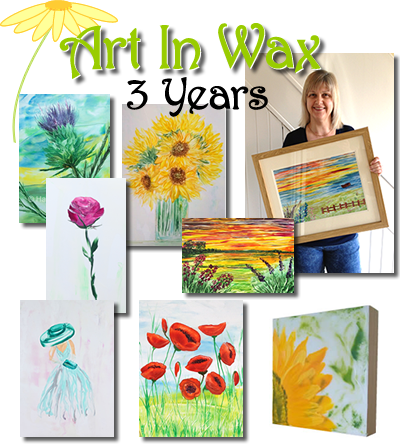 It is three years at the weekend that I started to paint in wax, my encaustic starter kit from Arts Encaustic was delivered on the 5th April 2011, I know it’s funny to remember but it was also the end of the tax year and it stuck in my mind and as I start to think about our year end again I am reminded …..
Back then I only painted onto specialist card using my iron and stylus, now I still paint with them, in fact I have several, the heated stylus tool is my favorite of all my tools, I use one as a hot palette knife and others with fine nibs attached for detailed work. Now I also have a collection of other tools, including my hotplate and heated air tool, which I use more in my work onto wood panels and other supports. I love to paint in wax and my style and methods of painting in this wonderful medium have evolved and developed over time and are still, as I experiment more with different supports and styles of painting. Please visit the Art in wax online gallery, exhibit and shop pages to see just some of my work that is online. As an artist I tend to have my favorites, as I’m my own worse critic I don’t always like some of my pieces in the beginning, they grow on me …… and yet others I love from the start but many I have a fondness for and some are on the walls in our home, I couldn’t show all my favorites here as there are too many, but the few featured here show a sort of timeline. From the early thistle, that was shown on TV as I loaned it to Micheal Bossom of Arts Encasutic for his demonstration on Create and Craft back in 2011 to the rose which is the subject of our first video demonstration. Lady Elizabeth, who was in my first online exhibition “Lady’s Day“, to the vase of sunflowers, also from an online exhibition a couple of years ago, to more recent, the wonderful sunsets with there vibrant colours, the one I am showing here, that I am holding was recently displayed at the Cliffs Pavilion at the Southend Art Club Spring exhibition, which was my first offline exhibition and great fun, I was the only Encaustic artist in the show. 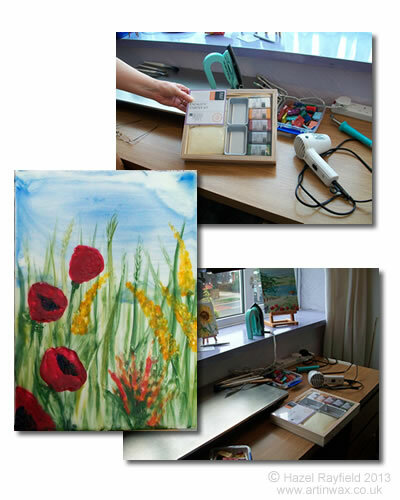 I love painting Sunflowers and the one to the right is on a wood panel, a new series and style of working with wax I have included in my portfolio, plus my most favorite of flowers to paint at the moment …… Poppies of course ….. Anyway back to the clean up….. Working with wax is great fun, but when I am in full flow it is also very messy. I have been working with my hotplate recently and decided it was time for a Spring clean, so all the pots with the wax have been cleaned and now have fresh clean wax, melted and ready to use, plus some of the tools, where possible have had a clean and are ready for my next project. 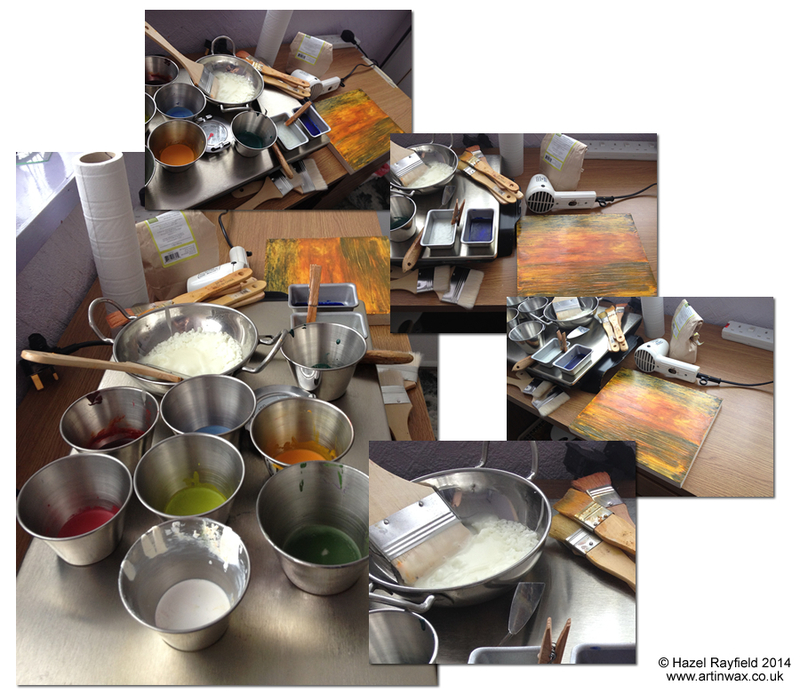 When working with the hotplate onto wood panels or Encausticbord, I use a US manufacturer of wax medium and wax paintings ; R&F Handmade paints, which I source from a couple of there UK suppliers, either Fred Aldous or Jacksons Art mostly, but when working onto the specialist gloss card I use in many of my works I use a brand of wax by Arts Encaustic who are based in the UK. As you can see I am now ready for my next project and to have fun and make more mess with wax !! !